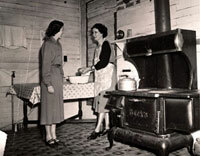 Photograph depicting Alma Hastings and Sue Wells, a TVA home economist, at the Hastings’ home in Henry County, Tennessee. Prior to the current age, food preparation took months of planning and dedication. 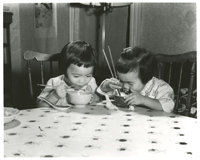 Putting meals together was more than scanning directions on the back of the box; it required hard-earned wisdom and a lot of time. For example, a vinegar recipe from the 1800s states, “It should be made in May to be ready for the fall pickling.” The exhibit covers not only how food was prepared but also how the latest technology has transformed the face of modern day cooking. The exhibit delves into Native American cooking, Pioneer/Civil War cooking, Victorian cooking and cooking in the Modern Age. 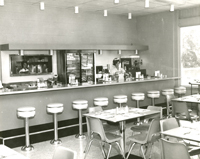 Join us for a nostalgic view of the way the original Betty Crockers got it done! Whether you eat fitness bars or indulge in Ben and Jerry’s, our exhibit will satisfy your hunger to know how food preparation originated. Bring your intellectual appetite! 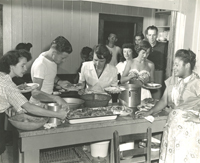 As technology has developed, cooking methods have changed. Fireside nd hearthside cooking are things of the past. Microwave meals, suppers in a box, fast food and Iron Chef have become the way of the present. But, has something been lost? 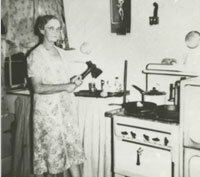 Old time cooking required a certain amount of social interaction. Everyone helped from chopping wood for the stove to laying the strips of crust on a pie. In the Native American culture, the men hunted and fished while the women farmed and gathered. Everyone worked together for the good of the family and for the good of the community. 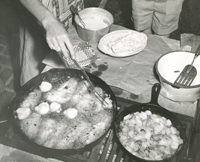 Cooking skills were learned by the fire, hearth or stove from parents, grandparents, siblings and friends. What does the future hold? The future is always uncertain but one thing is clear. However we put food on the table, it is better if we do it together. As hunters, farmers and gatherers, the Cherokee people have a great respect for nature. They are very spiritual people and ask the deities of the sun, moon, stars, plants, animals and elements to help them in their endeavors. Typically, the men hunt and fish while the women farm and gather. The men hunted bear, deer, elk, rabbit and turtles. They also made traps and nets to catch many different types of fish. They did not have to hunt all the time. They had livestock consisting of pigs, cows, and chickens. The Cherokee also raised sheep for milk and meat. The Cherokee people did not just eat the meat of the animals; they also used the skins, antlers, bones and shells to make things like clothing, tools, sewing needles, hunting equipment and rattles. The women planted beans, squash, sunflowers and tobacco between rows of corn to save land for hunting. They put the corn into storage cribs for the next winter, spring and summer. Some of the Cherokee grew pumpkins to eat and to feed their stock. They gathered wild plants and herbs. The women made soups with meat, roots and produce from their crops. They made corn into corn mush and cornbread. 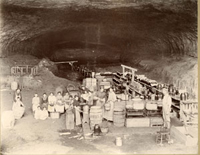 Both women and men worked together in groups for the good of the community. 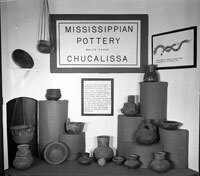 Cherokee potters created pots for practical uses. Whether for cooking or for ritualistic purposes, Cherokee pottery forms were kept simple. Typically, pottery was shaped to be used as cooking pots, storage jars, water jars and dishes. Round pots were usually used for cooking, while pots shaped like people, fish, birds and other animals were “effigy” pots used in spiritual ceremonies. Corn has long been considered sacred by Native Americans and many tribes have told stories regarding its origin. Corn, among Native American agricultural peoples, is regarded as female and a primal source of life endowed with both intelligence and remarkable powers. The Cherokee tell the story of Selu, the Corn Mother. From Selu’s body comes corn and beans. She cut open her breast so that corn could spring forth and give life to the people. Selu is remembered at annual plantings of the corn with ceremonies where people honor her with songs, dances and prayers. 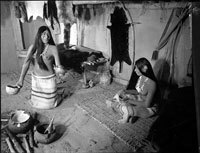 Myths and stories about the Corn Mother are not specific to the Cherokee but are found throughout the world. Today’s society and culture owes much of what it has learned about foods and crop growing to the Native Americans. One of the tribes native to this area is the Cherokee. The Cherokee lived in the southeastern woodlands that are now Tennessee, Georgia and the Carolinas. They were creative and accomplished cooks. They taught the pioneers how to grow, process and store foods, especially corn. The Cherokee helped provide the pioneers with cooking skills. 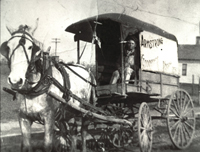 The pioneers were a diverse crowd made up of many immigrants. Each group brought their own distinctive food and agricultural practices. The result was a blending of these immigrant practices with Native American traditions. 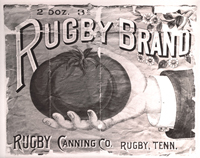 This blending brought about the distinctive food culture we have in Tennessee, today. Food preparation in pioneer days was complex. Not only were grocery stores as we know them unavailable, but all products had to be prepared “from scratch.” This meant that for meat an animal must be killed, butchered and prepared. If it was a large animal, portions of the meat were stored for future consumption, either by smoking or “salting down.” Wild plants were often harvested and eaten like vegetables; so, knowledge of botany was needed to learn what was edible and what was not. Some plants could be poisonous at various stages. For example, a fine Southern salad of “greens,” is Poke Salad. Legend has it that the berries are poisonous. If not prepared properly, the Poke Salad plant contains a substance that is very toxic. Another name for the plant is American Nightshade. In order to avoid illness, the leaves must be boiled twice, using different water each time. The water should be thrown out and not re-used because it will still contain those toxins. Vegetables and grains that were grown had to be harvested at the right time, including threshing the wheat and grinding it into flour (sometimes at a mill, if one was lucky enough to have one in the neighborhood), then adding other ingredients. 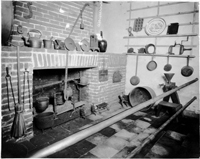 The resulting bread was baked in an “oven” over coals or in an oven built into the side of a fireplace. There were no timers or thermostats to determine how hot the fire was, or how long to leave the bread baking. 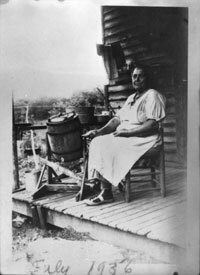 Cornbread was made by harvesting corn from the plant, cutting the corn off of the cob, drying the corn, and grinding it into cornmeal—whether done at home or at a mill. Cooking utensils consisted mainly of frying pans, coffee pots, buckets, iron pots, and hollowed out gourds for storage. Iron cooking pots were heavy and did not cook foods evenly. Pots that were used over the hearth could weigh as much as 24 pounds with inch-thick walls, so it took a while for food to heat. By Civil War times, dry goods stores were available, but most of the produce in them was dried or smoked. There was very little fresh produce or meats, except “in season.” In the South, wealthy families had kitchens that were separate buildings from the main house. They did this for many reasons. The most important was the fire hazard of cooking over an open hearth. Another was to avoid the aromas of food preparation, especially of pungent dishes, including Poke Salad. And, last but definitely not least, in the days of no air conditioning or fans, the heat of an open fireplace would be uncomfortable for those wearing corsets and hoop skirts, especially in the heat and humidity of Tennessee summers. The Union blockade of the Confederacy meant many items quickly became unavailable in the South. The most well-known shortage was coffee. Many coffee-type drinks were made with things other than coffee. The chicory coffee developed by the French in New Orleans was the most well-known. Chicory coffee was such a well-liked substitute that it is still popular today in many areas. Lesser known coffee substitutes included using parched acorns, roasted corn, rye, okra seeds, sweet potatoes, and peanuts. None was very tasty and many upset the digestive system. The only alternative which contained caffeine was made from the leaves of the native yaupon shrub, a member of the holly family. It, too, was difficult to digest. In fact, Native Americans used it to induce vomiting or for laxative purposes! Joseph D. Thompson was of Irish descent. He was in the shoe business in Cincinnati, Ohio, prior to the outbreak of the Civil War. He enlisted in the Confederate Army immediately after the secession of the Confederate States. At the time of his enlistment, he was living in Memphis, Tennessee. Mr. Thompson spent the entire war in the 38th Tennessee Regiment. He and his wife, Mary, had 8 children; however, only 3 survived to adulthood (Edgar, Ella, and Grace). After the war ended, Joseph Thompson returned to Cincinnati with his family. He died on Thanksgiving Day, 1881. The following letters were written by Joseph D. Thompson to his wife during the Civil War. The letters primarily focus on Mr. Thompson’s experiences as a Confederate soldier. Food consumption and preparation was a common thread throughout Mr. Thompson’s letters. .
Mary Brown Daniel, Sarah M. Stevenson, Mary Champ and Maude Murray holding a Japanese tea. Miss Daniel later married John Trotwood Moore. 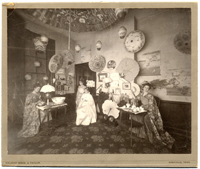 Upper class entertainments like this “Japanese” tea party, complete with props and costumes, were largely made possible with the help of servants, who could assume the drudgery of everyday cooking and provide leisure time for the lady of the house. By the mid nineteenth century, poor African-American and immigrant women had few employment opportunities outside of domestic service. Their labor was so under-valued that even middle class households could often afford at least one servant. A cook was usually the first servant hired. As factory work gave poor women new opportunities, it became more difficult to entice them into domestic service, where their work was tedious and they were under the constant supervision of the lady of the house. By the 1890’s, etiquette books advocated specifically designating the servant’s duties, and even recommended respecting the servant’s days off. Women canning for the Ritchie Cannery in Thompson’s Chapel, Claiborne County, Tennessee, 1910, Looking Back at Tennessee Collection Unidentified male posing with the horse-drawn cart of Chas. Nickens, Dealer in Fresh Meats. 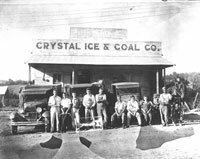 Meat Wagon, n.d., Library Photograph Collection Pictured in this photograph of the Crystal Ice and Coal Company in Woodbury, Tennessee, are left to right: Ralph Adams; Orville Conley; Robert Adams; Fred Adams; Oscar Cook; Henry Bratten; Carl Adams; Frank Adams; Bo Batey. Heat was difficult to regulate. The temperature would drop when fuel was first added. Wood and coal fires lasted about two hours, requiring frequent re-fueling and cleaning of the ash pit. 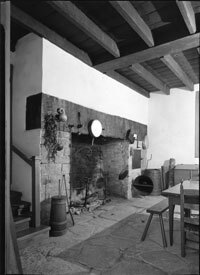 The dampers had to be regulated to prevent heat from escaping up the chimney, and to prevent smoke from filling the kitchen. Overheating the stove could crack the cast iron, or worse, start a house fire in the flue. To prevent rusting, you could rub the cast iron with a greasy rag, or use a commercial “stove blacking” compound. The covers (burners) on the left would be hotter than those on the right. To estimate the temperature, you would stick your hand in the oven. The longer you could hold it there, the cooler the oven temperature. 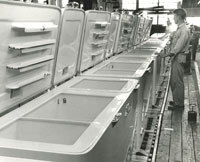 Cakes and breads had to be turned regularly to prevent them from rising only on the hot side of the oven. It was important to know your woods. Pine, for example, burns extremely hot and fast; hardwoods, such as cherry, oak, or hickory burn more slowly. Each kind of wood also imparted its own flavor to the food. 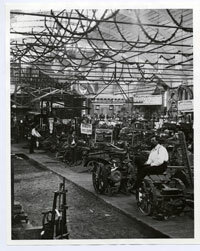 Interior of Nashville Centennial Building showing displays of agricultural implements, parlor stoves, cook stoves and household decorations. The Nashville Centennial Celebration (not to be confused with the 1897 Tennessee Centennial Exposition) was held in a building built for that purpose on Broadway and 8th Ave., across from the Customs House. ca. 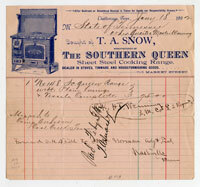 1880, Library Photograph Collection Receipt for a Southern Queen range purchased from T. A. 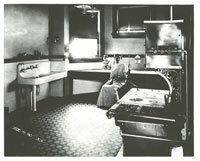 Snow, 1892, Tennessee National Guard Adjutant General’s Office Military Records Photograph of the kitchen in the home of Mr. and Mrs. Holsten Wilson in Farmington. Mrs. Lena Wilson is churning butter. Notice the Royal Enterprise wood stove in the background. 1937, Looking Back at Tennessee Collection. 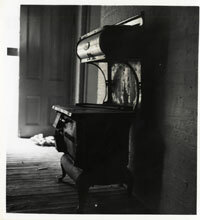 By the end of the 19th century, gas stoves were beginning to replace coal and wood stoves in American homes. With the advent of electricity and the incandescent bulb, gas companies realized that gas would be replaced as a lighting source, so many of them began to market gas stoves, heaters, and furnaces in order to create an alternate demand for their product. 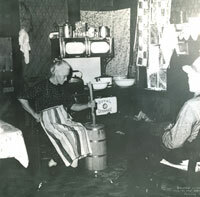 Gas stoves had numerous advantages over coal and wood: they were lighter and smaller than coal and wood stoves; most of their surfaces remained cool unlike coal and wood stoves; they did not require frequent tending; and, with the advent of the oven thermostat in 1915, they offered easier and more consistent temperature control. 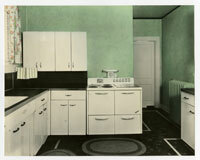 Gas stoves outnumbered coal and wood two to one by 1930. Exhibit by the Woodrow community of Maury County at the Tennessee State Fair. 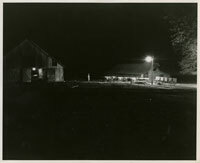 Begun in 1940 as a response to the Depression by Governor Prentice Cooper, the Tennessee Home Food Supply Program encouraged farmers to replace cash crops with food crops. 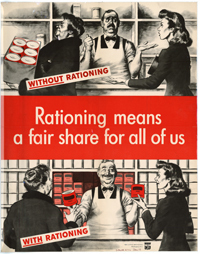 Since the program encouraged farmers to raise 3/4 of their own food, it augmented rationing and was continued throughout World War II. 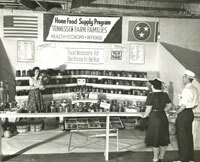 By 1944, 85% of Tennessee’s farms were enrolled in the program and 30 other states had adopted similar programs. C-ration: Complete ready-to-eat meal in 6 12-ounce cans. 3 cans contained a meat entrée and 3 cans contained cheese, crackers, candy, and dessert. An accessory pack contained a mix for a hot beverage, salt and sugar packets, a plastic spoon, chewing gum, and a pack of four cigarettes. D-ration: A bar of concentrated chocolate to serve as a high-energy emergency ration. 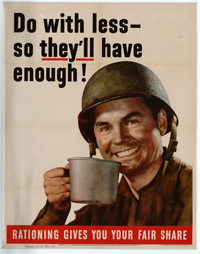 K-ration: Individual daily ration for troops in combat that contained 3 meals (breakfast, lunch, and supper). Uniform coupon rationing: Provided equal shares of a single commodity. Coupons were good for a stated quantity and were used for sugar and coffee. Point rationing: Provided equivalent shares of a group of commodities. Coupons were good for “points” to be spent for any combination of items. 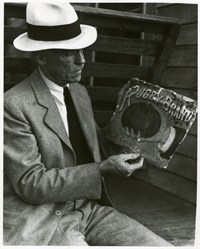 Point coupons were used for processed foods, meats, fats canned fish, cheese, and canned milk. As much as Americans love to cook, we also love to eat out. Nationally, there are approximately 935,000 restaurants with projected sales for 2007 totaling $537 billion. In Tennessee, there were 8,257 restaurants operating in 2006. They employ approximately 270,000 Tennesseans and are projected to have sales totaling $8.1 billion in 2007. Civil Defense display in a Giant Supermarket. They are recommending the groceries needed for one person to survive 14 days. Shows Carnation canned milk, pork and beans, Pepsi-Cola, Campbell's Soups, and other items. Probably nothing epitomizes the post-World War II culinary landscape in America as much as Poppy Cannon’s The Can Opener Cookbook. While creativity was prized, so was the reliance on convenience. Convenience, in turn, meant a reliance on processed, pre-packaged goods. It was the era of the casserole, recipes for cooking with 7-Up, and the (in)famous TV dinner. Tennessee has experienced a large influx of immigrants in recent decades, which has drastically altered what we eat. Whether it's enchiladas, Pad Thai, dörner kebabs, ćevapi, or tikka masala, Tennessee's immigrants have changed the way we eat. From 1960-1990, the foreign-born population in Tennessee more than tripled from 15,843 to 59,114. According to the 2000 Census, Tennessee's foreign-born population was 159,004 and one estimate puts that figure at 210,635 for 2006. The 2000 Census listed the top ten countries of origin for Tennessee's foreign-born population as follows: Mexico (44,682), Germany (8,316), India (7,701), Canada (6,981), China [including Hong Kong and Taiwan] (6,141), Korea (6,106), Vietnam (5,949), United Kingdom (5,726), Philippines (4,078), Laos (3,666).